Sleeping 8 La Croix is a converted Breton Long Barn, set in a small hamlet called Kerigan in beautiful countryside, 5 min walk from Lac de Bosmeleac. La Croix is an ideal getaway for those seeking tranquility, space, walks, bike rides and fishing. 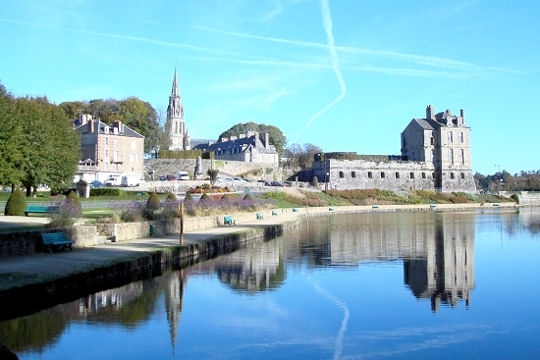 It is ideally situated for exploring the many historic sites of Brittany and its stunning beaches (closest 45mins drive). The house has 4 bedrooms, two bathrooms, two separate WC's, kitchen, open lounge/dining room with log burner. It has electric heaters upstairs, combination of electric and night storage downstairs and a log burner. Lounge - traditional terracotta flooring and wooden beams, stunning stone fireplace and wood burner, two beautiful armoire cupboards, TV (incl. satellite channels), DVD player. The three sets of doors all open onto the patio. The dining table extends to seat 8. The kitchen has - Gas cooker (bottled), fridge/freezer, double sink, toaster, microwave. Bathroom 1 - shower/bath/sink. The downstairs bathroom houses the washing machine and condenser tumble dryer. Bathroom 2 - shower/sink. Two separate WC's. A bottle of wine awaits you! Master Bedroom - beautiful polished wooden floors, king size bed, built in wardrobes and cupboards. Twin Room 1 - these beds can remain singles or can be positioned together (mattress overlay) as a double. Polished wooden floors, hanging rail and large wooden drawer chest. Twin Room 2 - smaller bedroom, built in cupboards. Children's Room - sleeps 2 - two single beds (there is a toddler bededge protector) - bunk bed system. Cupboard. They have all the requirements for babies and children - travel cot, high chair, steriliser (microwave use), plastic cutlery, backpack for walking, outdoor toys. There are also adult bikes belonging to the owners, which you are welcome to use, but please note that these are not serviced regularly, so you not only have to take them as you find them but using them is at your sole responsiblity! Garden - expansive enclosed garden and gated driveway, ample parking space. Patio, Brick BBQ, table and chairs. Activities - table tennis table. Two outbuildings - one houses all the garden activities and the other houses the wood for the wood burner. No Pets. Linen & towels provided. The nearby Lac de Bosmeleac (5 mins walk) is a walk down the lane - circular walks round the stunning lake, sandy beach and play area, pedals and sailing dinghies for hire, fishing (there are plenty of mixed course fish including carp, pike, tench, perch bream and rudd. Licences are required which can be bought from the local Tabac or Mairie), cafe in high season for ice cream and pizzas. Lac de Geurledan (20 mins drive) - Europe's largest inland lake - boating, pedals, water-sports (water-skiing, canoeing), cycling, walking.